In 2013, Dalkeith Plastics Pty Ltd was the successful contractor to weld 7.0 km of 560 mm Pn 16 HDPE for the SA Water project. Contracted by Interflow Pty Ltd and B J Jarrads Pty Ltd, the project ran for approximately 6 months. Welding consisted of building 160 m – 240 m lengths of pipe that was externally de-beaded for the ‘Close Fit Lining’ process. The Dalkeith welders were assigned a lay down area which in fact was also the site area for the major works being carried out. Use of space was a challenge and required a co-ordinated effort between the other contractors. The welding area was also where the pipe had to be stored before welding. Each length of 560 DN pipe weighed 2.5 tonnes and required a 30 ton excavator to move one at a time into the welding machines. allowed a consistent work programme with limited down time. ‘Pulling of the strings’ through the ‘close fit lining’ process was carried out on night shift. The process resulted in limited disruption to the road users. This allowed for the large lengths of pipe to be dragged out onto the road on rollers to minimise damage to the pipe. This process involved a ‘Die Reduction Hydraulic System’ that reduced the 560 DN pipe to approximately 520 DN with 75 tonnes of hydraulic pressure. The new HDPE pipe was then pulled through the existing steel main with rods that required, at times, 100 tonnes of pulling pressure. Once the first section of pipe was pulled through, with approximately 40 metres left out of the ground, the Dalkeith welders would then join another 160 – 240 metres of pipe to the length being pulled in. This would be carried out 2 or 3 times for each pull section. Dalkeith welders were really tested at this point as each weld would be exposed to extreme hydraulic pressure not long after completing the minimum cool down time for the weld. 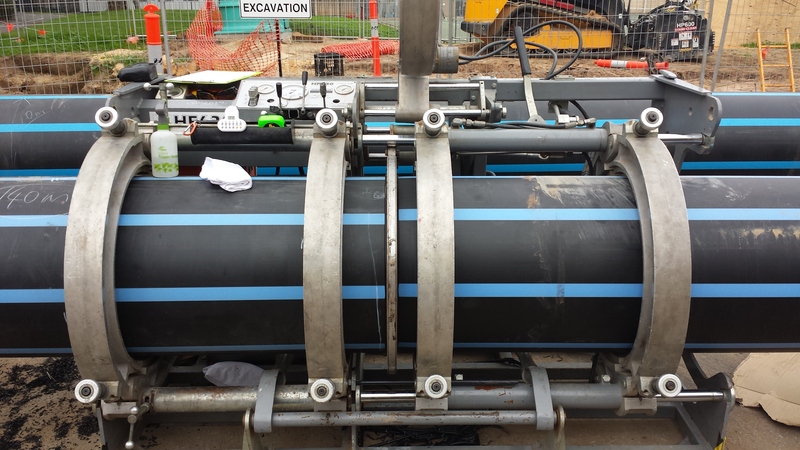 Dalkeith Plastics Pty Ltd was also contracted to complete the ‘Tie-in Process’ of Electrofusion welding the pipe lengths together in the designated pits. Care had to be taken in preparing the pipe for Electrofusion. The team used a rotational scraper that removed layers of 2 – 3 mm of material in each rotation. The pipe was always made level and kept level through the ‘cooking’ process of the fitting. Each fitting required close to a 40 minute ‘cook time’ to complete. Due to the unforseen change in height of the existing water main through road intersections, Dalkeith were given the task to fabricate ‘dog-legs’ or fabricated segmented bends to compensate for the height difference. This work was carried out in the workshop and then fitted on-site. Dalkeith Plastics Pty Ltd provided individual weld parameters, weld machine Q.A. and weld logs for every weld completed. We can proudly say that every weld was successful in the highly intensive process that is ‘Close Fit Lining’.